Lexus V8 Stack Injection quad pro street IDF set. 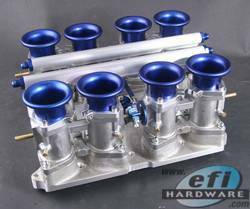 Kit includes manifold, studs and nuts, assembled throttle bodies, linkages, ram tubes, fuel rail kit with -6 or -8 AN ends. We rate our 50mm V8 Stack and Cross Ram kits at 580HP - 600HP Naturally Aspirated.